Undergraduate students majoring in behavioral science, English/Creative writing, global cultural studies, intelligence and national security, psychology and more came together to present their research and readings at the Sixth Annual Humanities and Human Sciences Symposium April 24. 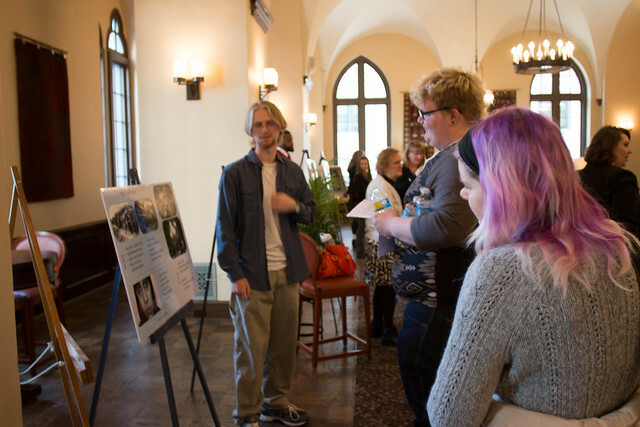 The symposium, co-hosted this year by Karen Dwyer, Ph.D., assistant professor of English, and Barbara Barrow, Ph.D., assistant professor of British Literature, began with students presenting poster displays and digital exhibits of their research proposals. "As a member of the Honors Program, it was a great opportunity to share my research with others," remarked Shelbie O'Hara, a freshman premedical and preprofessional studies major, whose research poster examined the artificial food dye Red Number 40 and its potential correlation with hyperactivity in children. "I loved seeing how students took discipline-specific content and transformed it into a form they understood and cared about. The research posters and presentations speak to myriad ways that our students think, of course, but also to the vast and varied students who compose our population," explained Dwyer. Following the poster and digital presentations, keynote speaker Megan Ward, Ph.D., assistant professor of English at Oregon State University, spoke about digital preservation and her work as associate director of Livingstone Online, a digital archive of the Victorian explorer David Livingstone. "It was a very intriguing presentation about the methods involved in uncovering information about documents. I learned that gathering information about the physical material can provide context for the document," said Matthew Danko, a senior cinema production major. "It's cool to better understand the ways technology is changing how we view historical texts," added Zachary Borzovoy, a junior English/Creative writing major. After Ward's presentation, student panel sessions took place throughout Academic Hall and were moderated by faculty members Barrow, Dwyer, Helen Fallon, M.A., Kirstin Hanley, Ph.D., Sarah Schulz, Ph.D. and P.K. Weston, Ed.D. Also, new this year, was an open mic reading in which students read their original poetry, fiction and nonfiction. "I was really impressed with the creativity and dedication of the student work. It was rewarding to see how the students crafted and improved their presentations between their initial practice in my classes to their final presentations at the symposium," said Barrow. "The symposium was a very enriching and constructive experience that has made me more comfortable with presenting my ideas and writing for the public," said Borzovoy.